I know the best face primer for oily skin. Read on and you will too. Those of us who have had to contend with oily skin will have you know that primer is the best invention since the woman. Yea, it does not get any better. Oily skin is unique in many ways, and you only get to know that when you stop tormenting it with product that promise to combat shine. What does Primer do For You? It helps keep your makeup in place, especially during spring when the atmosphere is charged with humidity. You have the option to use it as base for your foundation to keep it on for longer, or even apply it on its own. If you want to give your skin a break from makeup but still wants to look better than you would in your naked skin, apply some primer. The difference will surprise you. One more thing that primer does: It gives your foundation a smooth finish. There are many benefits for using primer. Choosing a primer that suits you could be challenging. If the primer does any of the following, you have found the one that you need. Seals or covers pores - this is one of the many reasons that women use make up. Sometimes though, foundation alone seems insufficient for cover-up. With the advent of primers, women everywhere have been celebrating. The ideal primer helps reduce those overly large pores and cover lines and wrinkles. It seals flaws and prepare your face for foundation. Makes makeup stay longer - this is another popular reason for using this wonder product. When using the best primer for oily skin, it controls oil thus making your makeup stay on longer than before. Appear youthful - there are primers that have anti-aging effects but what primers mostly do is to give you a flawless makeup finish that makes your skin looks smoother and thus appears younger. Lightweight - you have to place a couple of layers of makeup on and it can feel a bit heavy if you think about it. The ideal primer though does not make you feel that way. Your face feels natural without any heavy feeling and still look flawless and oil free. Easy to use - most primers are just a one-application formula. It is easy to apply using just your fingers. It almost feels like you are applying facial lotion - it is that light and easy! Non-comedogenic - these make up primers have been made non-comedogenic so it will not clog your pores but at the same time cover skin flawlessly without making you break out. This makes it an ideal base for the rest of your make up. Smooth and soft face - putting primer on leaves your skin that much smoother and softer thus making it an ideal canvas to put on your foundation. Your skin will have the velvety silky feeling that is unachievable with just foundation alone. Most primers aim to provide you with an even skin tone and texture. Once you’re done applying, you can instantly feel how much more smoother your skin is. A good primer will not leave you with any greasy feeling at all! It is, after all, a product aimed to control oil and greasiness at the very first place. This primer is water based, which gives it the much-desired lightweight. Since the oily skin is already, well, oily, it does not need additional oil from oil-based primers to clog it up. It lasts the day to keep your makeup in place for up to 6 hours if you wore it under most foundations. 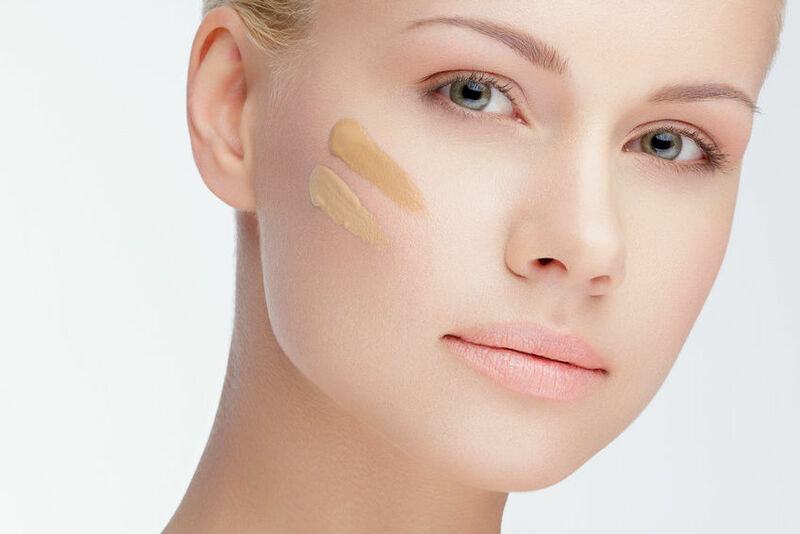 If you used a long-wearing matte foundation, you could have it on for up to 8 hours. You can use this primer as pre-foundation or over the make-up. It works well either way. However, it works best when used pre-make-up, as it prepares the skin for foundation and smoothes its application. This product is quite cheap for a primer of its caliber. The application process can be quite daunting. If you do not follow it to the letter, you will end up with lumps on your face that will prevent the same thing that you are trying to achieve (smooth preparation for your foundation). This product is priced better than most primers on the market that do not do half the job it does. The water base makes it a winner with oily skin. The matte works so well that you could go the whole day without needing to refresh it. As long as you master the art of applying it, this primer is the ideal match for oily skin. 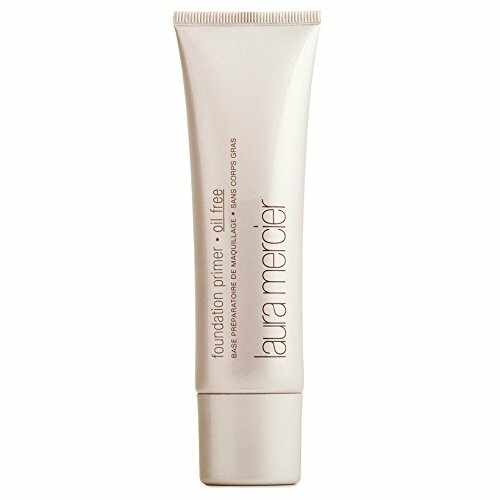 The radiance shows through the white tube, and you get the feeling that the Laura Mercier Foundation Primer is going to make your skin glow even before you apply it. This primer has small doses of antioxidants, which may not be that significant to make you skip your dose of vitamin C, but still good enough to make you appreciate the thought. This primer works great on both oily and normal skin types. It gives the skin a luminous glow that lasts the whole day. This quality makes this primer the ideal product to apply on your skin for the entire day without foundation, should you feel the need to give full makeup a break. If you apply your foundation over the primer, the shine still shows. It is silky when you feel it on your fingers, and that silkiness smoothes the skin to make the ideal base for makeup. It blends into the skin. Part of its ingredients is some non-fragrant plant oils and antioxidants that give your skin a boost apart from prepping it for makeup. This primer is quite easy to apply. It does not require much from you, just the use of your fingertips and a gentle rub. It is oil-free, which means that it will not do further damage to your oily skin. Since it does not dry up into a matte, it feels comfortable for people with normal skin too. It has a fragrance, however subtle. I like the glow because it makes me feel confident enough to go without makeup for the day. These makeup free days (which are becoming increasingly many) give my skin the chance to breathe. The price is ideal. The first thing that caught my eye when I first saw the Hourglass Cosmetics Veil Mineral Primer online was the SPF feature. With its skin protection property (which consists of 2.45% of titanium dioxide and 4.20% of zinc oxide), you can apply this primer and get along with your day without makeup. It is ideal for all skin types, buts especially good for skin types that are prone to breakouts. The presentation is sleek, in a white bottle and dark cap. It is lightweight, as opposed to most silicone-based primers, and it disappears into the skin five minutes after application. It is not complicated to apply, as you just use your bare fingertips for rubbing it in and a brush for finishing. After application, let it sit for five minutes to dry. 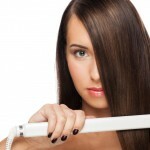 It leaves a silky powdery feel and look when it dries and will stay on for as long as 12 hours. 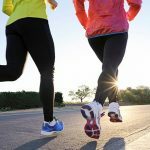 The zinc oxide and titanium in it protect the skin from the effects of the sun. In most cases, beauty experts recommend that you apply your sunscreen after applying the primer, but with this particular brand, you do not need to worry about it. It smoothes the skin and prepares it for foundation, thanks to its powdery property. It also improves the appearance of the skin, albeit subtly, and seals large pores so that they become almost invisible when you apply foundation. It is pricey. The Hourglass Cosmetics Veil Mineral Primer has to be one of the most expensive primers out there, but the results are worth it. The Hourglass Cosmetics Veil Mineral Primer leaves the skin smooth and silky so that the application of makeup is smooth. It may cost a pretty penny, but you only need a little of it. 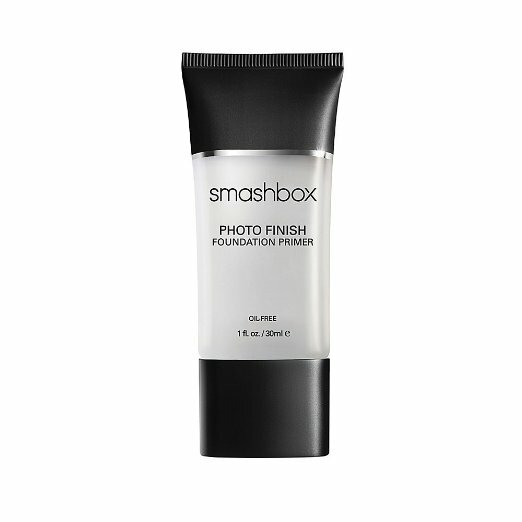 When I first saw the SMASHBOX Photo Finish Foundation Primer, I did not care much for the packaging, but I bought it anyway. I later looked at it critically (after purchase) and noticed that it was not at all bad. Matter of fact, I like it. What makes this product a good primer for oily skin is the list of ingredients that contain no fragrance and substance that could aggravate blemishes. It is water based (up to 60%), and so it does not include oil that could interact negatively with your already oily skin. It feels light on the skin so that you can apply it without makeup for up to 8 hours. It contains some amounts of Vitamin C, albeit low, but still enough to make a little difference. It is also fragrance-free and without parabens. It smoothes the skin to make way for foundation. The makeup stays on for longer by up to two hours, and it looks better even in areas that usually crack a bit. Because of the Vitamin C content, this primer helps the skin renew itself, especially when applied pre-makeup. This primer does not need any mastery of application. Fingertips work fine, with gentle rubbing to ensure that it spreads well on all parts. If your skin is oilier than normal and you use a matte-finish foundation, this primer will not hold for long. You may not notice the difference in terms of wear-time. The ingredients in this primer are ideal for sensitive skin types, and it contains no fragrance. It is reasonably priced too. I would recommend this for people with sensitive skin types. The packaging is simply, but the content is fortified with vitamins, antioxidants, and salicylic acid to protect your skin and get rid of acne. It is ideal for all skin types. Although the manufacturer lists the salicylic acid highly on the list of ingredients, the level in this product is too low to make it highly effective. Nevertheless, it is a good addition, even with its little soothing effect. It is silicone-based, so it smoothes the skin to provide the ideal canvas for makeup. It is fragrance-free, which makes it safe for all skin types. It is fortified with Vitamins E, C, and A, which are excellent in retaining the youth radiance of the skin. Your skin is nourished even as you pursue flawlessness. The mattifying aspect means that the natural shine of your skin will still be visible even with the application of this primer. It may not leave the skin matte (with a radiant glow), but it does not hinder the natural radiance of the skin from shining through. The plastic packaging is friendly for travelling, so that you can easily pack it in your travels without worrying about beeps at checkpoints. The mattifying effect on the skin ensures that the primer absorbs all the oil and keeps it looking oil-free for up to six hours during the day. It leaves the skin with a dewy feel, which feels comfortable and normal. It blends well into the skin and is easy to apply. It does not reduce the large pores, rather keeps them hidden for the while that the primer lasts. Even though it has salicylic acid, the levels are negligible and won’t be of much use considering that the PH level (6) is too high for the acid to be effective. 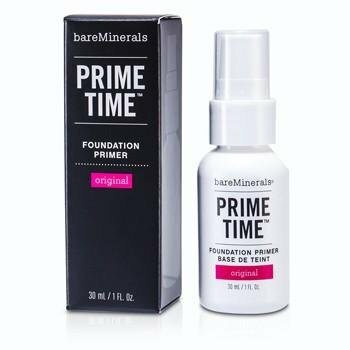 The packaging of bareMinerals Original Prime-Time Foundation P﻿rimer is different from most. The bottle is safe for travel as you can carry it in your handbag without worrying about its condition. The light property prevents it from clogging pores and gives it the hype among users. Though it is silicone-based, it does not clog pores. It is light on the skin and absorbs well in less than five minutes. The results of this application are a smooth, flawless skin that creates the ideal canvas for application of makeup. If you prefer to rock the natural look, you can leave this primer on for the day without applying makeup. Because it is silicone-based, it makes the skin feel silky and helps your foundation to run smoothly on the skin. 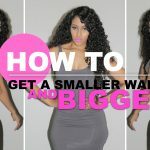 This primer is quite easy to apply, as all you need to do is spread it on your skin using your fingertips. Rub gently so as not to make it cling to the skin uncomfortably. For smooth results, spread it on your face as soon as you squeeze it out of the bottle to prevent it from drying. It feels moist for about three minutes before it dries up and leaves a matte finish. It will hold your makeup for up to five hours. It contains antioxidants that keep your skin looking youthfully radiant. The pump on this container does not always cooperate. It sometimes spurts all over. The price tag is reasonable, and although this primer is silicone based, it did not clog my pores. I do not like the packaging, but the vitamin C and E in the product make up for it. It is packed in non-pretentious packaging and is priced surprisingly cheap. It is silicone-based but ideal for all skin types. It is the primer you want to try when you are only getting in the habit of primer application, mostly because of its price. If it does not work for you, you will toss it without feeling the pain of having spent lots of money on it. It is lightweight, so it does not clog your pores. It smoothes the skin, getting it ready for makeup application that will appear smooth and last for up to 5 hours. It wears well under makeup because of the silicone aspect. This primer gives your skin a matte finish that reduces the appearance of large pores. It absorbs excess oil on your skin to leave your usually oily skin looking less oily and more matte. It has a creamy peach tint that keeps the skin looking shiny, even without applying too much of it. 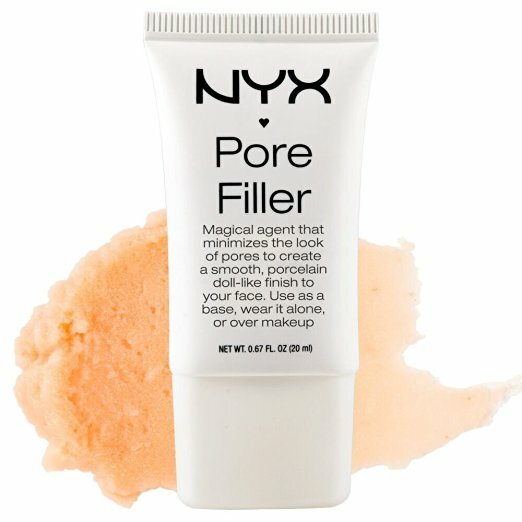 A little of NYX Cosmetics Pore primer goes a long way, so your reasonably priced tube will last you well over a month. Due to its light nature and oil absorbing capabilities, you can use this primer all by itself, without the need for foundation. As much as it conceals large pores, this primer will it make them entirely unnoticeable. If you are just starting your primer Chronicles, you may want to get this product first to introduce you to this world. It is priced well and it conceals pores with a level of admirable efficiency. It works well with oily and sensitive skin types. The pink packaging gives the product a girlie looked, which I liked quite. This primer is enriched with vitamins and plant extracts that not only promise to conceal pores, but also to hydrate the skin to leave it looking youthful and radiant. Its oil-free formula works well with problem skin. It is an oil-free to ensure that your oily skin is left as flawless as possible. Too-Faced Primer promotes the nourishment of skin through the ingredients, which include mulberry extracts that brighten the skin on those days when you are looking your age. It contains Vitamin A and cammelia oil both of which have superior qualities. Both of these ingredients combine to fight free radicals and to rejuvenate the skin of its youth. Since this primer is light, it does not clog the skin. It keeps makeup in place for up to six hours or longer depending on your skin type. It plays not only the role of a pre-makeup primer but also the kind that you can apply on your skin without any makeup for an entire day. It closes pores that are left open after cleansing, and conceals their appearance quite successfully. If you apply it as a pre-makeup aid, it smoothes the lines to create a flawless canvas for its application. It absorbs the excess oil and gives your skin the matte finish that we all love. If you apply too much of it, it causes your makeup to ball up. The ingredients make it a great product, and it is priced right. It contains small amounts of ivy extracts which may cause irritation to sensitive skin, but the levels are too low for concern. It is a great product. The Jouer Anti-Blemish Matte Primer comes in a slim and sleek packaging that makes you want to get it out rightly. The ingredients list makes for an enticing read. Looking through it is enough to get you to but this primer. It is priced in the range of most primers, though there are some equally effective brands retailing for less than Jouer Anti-Blemish Matte Primer. Some of the ingredients that make up this product include Vitamin E, aloe, Gingko Biloba, and Ginseng, which are known to have protective properties. Vitamin E ensures the regeneration of skin cells to keep you looking youthful for longer. The matte finish that you get from using this primer make it ideal for use on its own without makeup. If you intend to use it pre-makeup (as is the norm), you achieve a flawless finish from your makeup. It conceals pores so that they are not as enlarged as they would normally be. It contains salicylic acid, which penetrates the skin to fade existing blemishes that would have been caused by acne in your youth days and to prevent the development of new ones. Aloe extracts sooth the skin and maintain the supple property that appeals to everyone. Because it is oil-free, it works best for people with oily skin. The manufacturer taunts it to be a product for all skin types. Aloe, Ginseng, Vitamin C and Gingko Biloba are a great combo. This product is made with superior products, and it yields equally superior results. The first thing that you notice about this primer (apart from the beauty of its packaging) is its divine smell. It has ingredients in it that work wonders for the skin. The contention is on the price, but the product is worth it, in my opinion. It contains antioxidants in levels that are quite effective. Antioxidants fight free radicals and keep your skin looking youthful for longer. As with any silicone-based primer, this product makes the application of makeup flawless and keeps it on for up to 5 hours. It also has anti-inflammatory ingredients that protect the skin from external and internal forces. A pearl-sized amount of this primer will last you the day. It contains citrus extracts, albeit in low levels. 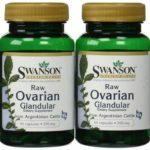 This extracts could irritate the skin especially in people with sensitive skin types. The delicious smell gives this product a place among my favorite primers. It is quite highly priced, so most people fail to see the reason why they should spend so much on a primer. If your skin is not sensitive and you could spare a few dollars, this primer is for you. Primer is a great addition to your beauty regime regardless of your skin type, but especially so if your skin is oily. It makes the application of makeup smooth and flawless and the results last for a long while during the day. Most products last from 4-6 hours. Manufacturers may say otherwise, but I have found in my experience that none of the product that I tested held my makeup for up to 8 hours. You can achieve a long lasting and flawless face with its special ingredient such as Vitamin A, Vitamin C and E, antioxidants that​ help reduce fine lines and other signs of premature aging. 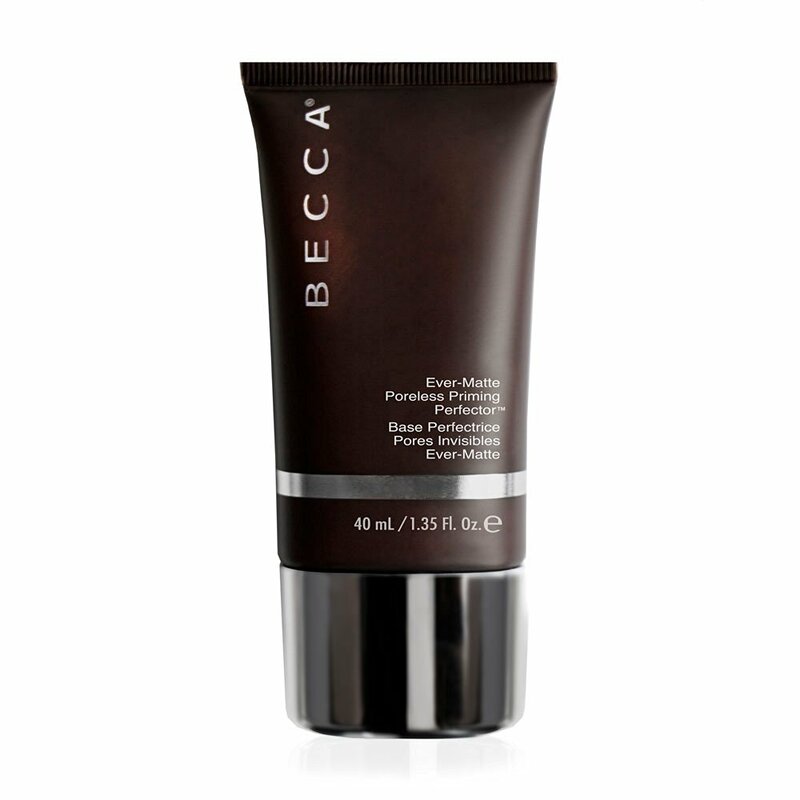 In my opinion and based on my experience, the best primer for oily skin is BECCA Ever Matte-Poreless Priming Perfector. It holds for up to 6 hours and has no additives that could aggravate my skin. Too Faced Cosmetics Primed comes a close second.